I agree that this would not be way it would happen, but I have been more convinced recently that Pitt could actually join. The reason is “Think like a university president”. They put a much higher value on the research quality, whose money far outweighs the sports side. I am not saying I expect it, but I would less completely shocked now. Congrats on being linked in the ESPN blog. I’m a Pitt student. From what I’ve gathered, the Big Ten speculation was almost entirely student driven. There was a big mandatory meeting for all athletes and many students were speculating/hoping that it was in order to announce a change in conference. Instead it was more of a athletes-only pep rally to congratulate the fall sports on their accomplishments and drum up enthusiasm for the spring sports. Maybe those student athletes tweeted about it beforehand, but did not explain that they were mistaken. Maybe some of those forum guys saw the tweets as confirming the mystery ‘sources.’ Maybe it was a deliberate move by Pitt’s AD to test the waters and let Delaney know we’re still interested. I certainly don’t know, but our athletic department isn’t dumb and this certainly isn’t bad press of Pitt. Most everyone realized this was just a bad rumor from the get go. I do believe that Pitt could be one of the three teams added when the time comes. I’m fully convinced they are going to add at least three teams. I think they see what the Big East has done in basketball and would like to duplicate that to an extent for both football and basketball. Also many people think ND is off he table because they have basically said they are off the table. I don’t believe that for a second. If ND gets word that one of the prominent Big East schools is leaving for the Big Ten their ears will certainly perk up. Notre Dame officials know that it would be a wise decisions regardless of what irrational fans are saying they should do. I think the Big 10’s leading candidates have to be ND, Texas and Pitt. I feel that in that case college sports as we know it will be turned upside down and the Big 10 will be viewed in a completely different light. Could you imagine how much of media darling the Big Ten would be with just the addition of Texas or ND let alone 3 schools of a high caliber. Maybe it’s whishful thinking but I get the vibe that the Big Ten is going big time. What intrigues me here isn’t so much the Pitt rumors, which at best would’ve been an attempted end-around some of its previously described deficiencies as a Big Ten candidate, but the possibility that the Big Ten could make expansion a two-stage process, first enlarging to 12 teams, then going to 14 a year or two later. As a Maryland fan, I wonder what withdrawal deadline or penalty the ACC has. Perhaps Maryland could become the 12th team for, say, 2012, with two more teams taken in for 2014. 1. the desire for a championship football game. There are two sides to enhancing BTN revenues. One is getting more cable subscriptions and you are right that Texas would be the best choice for that. However, I am inclined to think that the focus will be on increasing the attractiveness of Big Ten basketball in order to bump up ratings in the winter. That entails bumping up the basketball profile of the conference. If you accept this analysis then going to 14 teams makes sense and adding Pitt and Syracuse, along with some other, possibly football school like Notre Dame or Texas, would be optimal. Do you have any thoughts on the possibility that this is basketball driven? No conference expansion has been basketball-driven so far, mainly because TV ratings for regular season basketball games (outside of top tier basketball/second tier football conferences like the ACC and Big East) don’t approach those for regular season football games. Furthermore, the vast bulk of postseason basketball revenue is distributed by the NCAA and isn’t very dependent on what conference you’re in while the vast bulk of postseason football revenue goes to only the top football conferences. In any case, UT isn’t chopped liver in basketball. Moving to the Big 10 makes no senses geographically for Texas especially in basketball. The Longhorns currently get 3 road games in the state of Texas (Baylor, A&M, Tech) in conference play. Why would they want to travel so far north for conference games? It makes no sense for Texas to move to a northern conference. Mark my word, Texas will NOT be the 12th team in the Big 10. It makes as much sense as Boston College joining the ACC or S. Florida joining the Big East or TCU joining the MWC. Money talks. I have to disagree with Frank. Texas is not going to join the Big Ten. It will be Cincinnati or Missouri. Cincinnati has exactly zero chance of joining the Big Ten. UC is a tier 3 school with limited graduate school and research opportunities. It has football facilities that are small for the Big East, let alone the great temples of sport found in the Big Ten. THREE Nippert Stadiums could fit in Beaver Stadium or the Big House. I’m not saying stadium size is the best metric to judge a program by, but let’s be realistic. The football team has been pretty good the past two years, but UC as a whole simply isn’t on the same level as the Big Ten schools. Cincinnati brings far less to the table than Pitt. There is a decent chance that the conference stays with the current 11 schools. But if they indeed add a 12th school, it will not be Texas. Nope. Only if they expand to 14.
Who would you put in that 14, Richard? Assuming the powers that be determine that 14 is a sustainable/profitable number for a conference, of course. If both would join, the Big Ten could then have their pick from the top of the Big East: Syracuse, Rutgers, or Pitt. If it’s 14 with UT & TAMU, if they can’t get ND, then the 14th team will be one of Maryland/Rutgers/Pitt/Syracuse (unless the Texas teams push for Mizzou or Nebraska). If the Big10 locks up Texas, the 14th team will just have to not drag down the conference average in research and TV money. Texas is not leaving the big 12 and moving to an all north conference. That makes zero sense and will not happen. I could possible see Pittsburgh or Iowa State or maybe even Cincy or West Virginia, but Texas to the north is not going to happen. It is a ridiculous rumor. Terry, your not using your head. Why would the Big Ten want 3rd rate teams like Iowa State, Cincy, or UWV. Their presence would mean less dollars for all of the teams already in the league. Get your frequent flier tickets to Columbus and Ann Arbor ready! Rutgers would be a poor fit for the Big ten. Pitt makes a lot for sense than most of the other schools listed above. Notre Dame would be the best option but the Irish seem unwilling to join. I think Pitt would be an excellent fit as they are located between Penn State and Ohio State. Pitt would make an excellent 12th school for the conference. I hope this blog is correct. 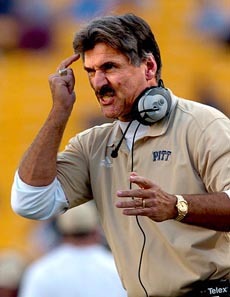 This blog has been saying that Pitt is not a good choice for the Big Ten. So, if you want the Panthers in the Big Ten, you’d better hope this blog is dead wrong. The Big East should toss Notre Dame, and leave them there for the Big 10’s taking. If this occurred, ND would have to join to the Big 10 simply so that its other programs had a home, and the Big 10 would probably be content to stay at 12 teams, which would keep the Big East intact. For self-preservation, that’s not a bad strategy. It’s not a bad strategy at all. However, it won’t happen because: (1) the Catholic members of the Big East would never kick out Notre Dame because there’s no other school that they want to be associated with more and (2) Pitt and, to a lesser extent, Syracuse have long football scheduling relationships with ND that they don’t want to jeopardize since they depend upon the games with the Irish to drive season ticket sales. ND could re-start a permament series with Penn State as an alternative in the East, which would be a horrible development for Pitt. It actually would augur more cooperation between the 2 conferences. If the Pac10 takes Colorado and one of Utah or Nebraska while the Big10 takes in UT, TAMU, and one of ND/Rutgers/Missouri, the 2 conferences between them would cover the whole country outside of the south. Outside the south, the 2 conferences would have all the major programs (besides Oklahoma, and maybe ND), almost all the major population centers, and most of the mid-tier programs as well. Think of the negotiating power if the 2 conferences banded together then. ESPN would have to offer them almost whatever they ask for, and if they do get the Big10 & Pac10 to go along with their SEC franchise, they could afford to lowball any other conference. brad pitt is joining the “big 10” .. did he have an “enhancement” or is it al natural..?? The big Ten expansion will occur & will include Notre Dame. the main purpose of any “leaked” rumors regarding Rutgers, Texas, Pitt or Missouri are primarily an attempt to wake up Notre Dame; the time is now to join the Big Bucks conference! Once the Big 12 membership is breached, whether by the Big Ten or by the Pac-10, then all bets are off as to which team or teams will become new additions to the Big Ten Conference. For example, if the Pac-10 successfully lures Colorado away from the Big 12, then Texas & Texas A&M will be ready–and politically able–to join the Big Ten. This results in the Big Ten expanding to 13 teams & still in need of one or three more teams to establish two divisions within the expanded Big Ten to facilitate a big bucks football championship playoff. Missouri, Nebraska, Pitt or Notre Dame will quickly follow. Texas & Texas A&M will jump to the Big Ten once Colorado leaves the Big 12 for three main reasons: money, to preserve the rivalry between the two Texas schools & to protect their recruiting grounds. Once Colorado leaves, then TCU will join the Big 12 giving TCU an equal chance at all Texas recruits if Texas & Texas A&M remain in the Big 12. But if Texas leaves the Big 12, then the most talented recruits will shun the weakened Big 12 conference to play in the super mega-conference Big Ten. if the big 12 does get breached, and i am still not sold..
it will disappear – pac 10, big 10, and sec will carve up the carcass – if there is anything left, they will be absorbed by the minors to survive.. I don’t think the Big XII will completely die. It will be more like the Big East after the ACC raid – extremely wounded but will survive in some form. If Nebraska doesn’t get picked up by the Big Ten, then I don’t think they’re really viable for the Pac-10 or ACC. Oklahoma is definitely not Big Ten or Pac-10 material and while they would fit in the SEC well, their market simply doesn’t justify being added. So, if you have a conference with Oklahoma and Nebraska, that’s going to survive somehow. The Big Ten has incentives to go to 14 schools with the Big Ten Network in a way that other conferences don’t, especially if the biggest prizes (Texas and Texas A&M) are taken off of the table. The SEC would only be able to add smaller or lower impact markets at that point, so it’s likely not worth it for them to expand at all. I’ve run a lot of scenarios, and it’s pretty unlikely the Big 12 will disappear. It would take a coordinated attack on the part of the Big Ten, Pac-10, SEC and Big East to pull it off (requiring each of those conferences to take some schools that maybe aren’t in their best interest and still leaving some for the MWC or C-USA to pick up), and I don’t see those conferences getting together to do that. The Big 12 will just reload with schools from the MWC, C-USA, or maybe the Big East if they still have the pull after they’re picked over. I could see the SEC taking OU along with A&M (OU does have a sizable following in Texas), but it might be tricky to separate the Sooners from Okie State. The SEC operates by the old TV model, though, where tradition-laden brand-name teams that draw strong national ratings are valuable rather than schools that can put a cable channel on basic cable in a lot of households in a geographic area. As a point of comparison, Alabama has only 1M more people than Oklahoma, and Louisiana has less than 1M more than Oklahoma, but both ‘Bama and LSU are national brands that people will watch. Oklahoma fits this model, so I expect the SEC to take OU (and OSU) eventually. If the Big Ten wants to expand by only one member to equal 12 members, then it will almost certainly be Notre Dame, the national champs of TV viewership. This addition to the Big Ten will not disrupt any other existing conference as Notre Dame is an independent. But the Big Ten doesn’t necessarily control its own destiny if the Pac-10 expands first by adding the Big 12’s Colorado to its west coast conference. Then Texas, Texas A&M & Nebraska will be looking for greener pastures as the Big 12’s most likely option to replace Colorado will be TCU–another Texas school. With Texas, Texas A&M & TCU in the same conference, Big 12 revenues shrink as the conference becomes too localized & too similiar to high school football conferences. Oklahoma & Missouri are likely to be calling the Big Ten as well. The Big Ten will have its pick of Big 12 schools so long as it takes both Texas & Texas A&M. Missouri,Nebraska & Oklahoma could follow making the Big Ten a 16 team football megaconference. If just Texas and Texas A&M move to the Big 10 from the Big 12, then Pitt will be the 14th member to create two seven team conferences. 1. If a Big12 North team goes, the Big12 will pick up BYU. No way another Texas team is added while they still have UT. 2. Oklahoma will never end up in the Big10 due to academics. Currently the Big Ten has many options to consider for expansion. First, will the Big Ten be expanded to 12, 14 or 16 teams? Second, should expansion focus on football (e.g. Notre Dame or Texas), basketball (e.g. Pitt or Kansas) or academic enhancements (Notre Dame, Texas or Cornell)? Although the Pac 10 would like to attract the University of Colorado & the accompanying Denver TV market, a Pac 10 football championship game can be accomplished with the addition of BYU & Utah from the Mountain West conference. And if the Big Ten adds independent Notre Dame, then the Big 12 will remain intact. However, to better understand the temptation of the University of Texas’ possible motives for wanting to join the Big Ten, just break out a map of the United States & a chart of the provincial Big 12 membership. The Big 12 consists of two 6 team divisions–the North Division & the South Division. Texas belongs to the South Division of the Big 12 conference which includes four Texas universities (Baylor, Texas, Texas A&M, Texas Tech) & two Oklahoma schools (Oklahoma & Okla. State). In addition to the far greater riches offered by the Big Ten Conference, the Univ. of Texas would like greater national & worldwide recognition for its powerhouse academics & research capabilities. While the highest paying football conference, the Big Ten, pays out $22 million per year to its members, research dollars to the top research universities is often counted in the hundreds of millions of dollars. The Big Ten conference is the Big Bucks conference for both football & research dollars. If Colorado leaves the Big 12 for the Big 10, then TCU will become yet another Texas school in the Big 12 South Division. The Big 12 South Division will then consist of 5 Texas universities (Baylor, Texas, Texas A&M, Texas Tech & Texas Christian TCU) plus one Oklahoma school. Even my prep high school was not as provincial since we competed against teams from at least 4 different states. The academic reputation of the University of Texas will decline as it becomes increasingly regarded as a state, not a regional, national or global, institution. This pending reality is why I believe that the University of Texas approached the Big Ten for membership consideration, and not vice versa. The first sentence contains a typo, it should read: “If Colorado leaves the Big 12 for the Pac-10…”. The universities of the Big Ten Conference are regarded worldwide as powerhouse academic research institutions which, accordingly, attract major research grant money. Michigan, Northwestern, Penn State, Wisconsin, Illinois, Michigan State, Purdue, Minnesota, Iowa, Ohio State & Indiana are best known for academics & research, not athletics, even though the Big Ten is the highest revenue producer from athletics in the world of higher education. Texas wants a part of this global recognition. Cornell University of the Ivy League also matches up well with the Big Ten standard of excellence in academics & academic research. Once Cornell joins the Big Ten & is permitted to offer athletic scholarships (which are prohibited in the Ivy League), then it will produce excellence in athletics as well. Adding two U.S. Senators from powerful New York state will greatly help the Big Ten’s political influence in Washington D.C. which will result in attracting even greater billions of dollars in research grants for Big Ten universities. The Univ. of Texas offers similiar academic, research & political benefits to the Big Ten members. Notre Dame does not, nor does Pitt, Missouri, Nebraska, Oklahoma or Rutgers. Only Texas, especially with Texas A&M in tow, and Cornell University match up well with the culture of the Big Ten Conference when expansion is viewed in the broadest sense of the universities missions, and not relegated to the narrow world of college atletics. In short, the Big Ten wants Texas more than it wants Notre Dame when academics & research are added into consideration. The addition of the Univ. of Texas to the Big Ten means billions more research dollars along with millions of increased athletic revenues. Will the Big Ten take Notre Dame ? Sure, as it will enhance athletic revenues for all Big Ten schools. Should the Big Ten be courting Cornell University? Absolutely yes, if it wants to go for increased academic prestige & enormous research grants. Are schools such as Pitt, Missouri & Rutgers being considered for membership by the Big Ten? Almost certainly yes, but only under certain scenarios requiring additional members to attain an even number of teams to facilitate a championship playoff. Texas wants the academic prestige & increased athletic & research dollars Big Ten membership offers. But, for complex Texas state political reasons, it cannot move first. The Univ. of Texas needs the Pac 10 to act first by disrupting the membership of the Big 12 conference. Once Colorado joins the Pac 10, then Texas & Texas A&M will be able politically to move to the Big Ten Conference. The Big Ten will then need at least one more school to form two divisions consisting of an equal number of teams. Pitt, Notre Dame, Cornell, Missouri, Nebraska or, even, Rutgers will do once the Big Ten & the Univ. of Texas each get the big prize–which is one another. If the Big Ten Conference decides to add only one team, then it will be Notre Dame. Although the addition of Notre Dame will not result in increased funding for research, it will add the lucrative TV market of the Northeastern U.S. And it will leave other existing conferences undisturbed. And it makes sense geographically & academically. The only other single team expansion choices that make sense geographically are Missouri & Pittsburgh. If the Big Ten decides to expand by three schools for a total of fourteen universities, then the top choices are Texas, Texas A&M, & Notre Dame. Missouri, however, becomes more attractive to the Big Ten if Texas & Texas A&M come on board due to its geographic location between Texas & the rest of the Big Ten schools. Expansion of the Big Ten Conference by three additional universities to fourteen schools requires at least one blockbuster addition, and there are only two realistic blockbuster candidates–the University of Texas and Notre Dame. The addition of Texas–with or without Texas A&M–will most likely lead to a five team expansion of the Big Ten for a total of sixteen teams to bridge the geographic gap between Texas & the other current Big Ten teams. The five team expansion will include Texas, Missouri & Texas A&M plus two others. Contenders for the remaining two spots include Pittsburgh, Notre Dame, Cornell, Nebraska, Kansas & Oklahoma. Expansion of the Big Ten Conference by three teams without Texas will include Notre Dame, Pittsburgh & either Missouri or Cornell. Hate to break it to ya, but Cornell’s not going to get the invite. I’ll have to agree with that one, although that would be the impetus for an amazing Big Ten hockey league. Not news to me; I’m just trying to expand thoughts regarding Big Ten expansion. Cornell & Notre Dame are the two best fits for the Big Ten, but for different reasons. Rutgers, on the other hand, is a terrible choice, in my opinion. The addition of Cornell University to the Big Ten would result in a cash bonanza of hundreds of millions, probably billions, of dollars in additional research grants for the conference member institutions, not to mention the publicity & surge of prestige in academics. Every reader is well aware that the Big Ten athletic payouts exceed $22 million per year, yet few are aware that Michigan State–as just one of many instances–was recently awarded a billion dollar research project. Speculations about Big Ten expansion options arise from many different perspectives. For example, from a purely sports marketing perspective Notre Dame makes the most sense, whereas from a larger “mission of the universities & biggest bucks” viewpoint, Cornell is the best choice, followed by the University of Texas. Certainly, Cornell University has a campus culture & institutional structure more like current Big Ten members than it does an Ivy league profile. Maybe they could be like the University of Chicago and join the CIC only. The Big Ten isn’t sharing their TV contract with anyone who doesn’t hold up their end. Cornell has many successful athletic teams; imagine what it could accomplish if able to award athletic scholarships in the revenue sports of football & basketball. Wrestling & ice hockey are highly ranked Division one teams. It would be interesting to poll Big Ten university presidents as to their top choice among Notre Dame (which was twice before 1999 rejected for membership), Texas & Cornell. However, the real issue is not whether or not the Big Ten wants Cornell, but does Cornell want the Big Ten? P.S. Cornell could easily buy the Big Ten Network & then decide whether or not it deemed itself worthy of participating in the TV contract revenues–which are tiny in relation to research grants. Cornell’s not joining. If Duke’s not willing to give up the ACC and Stanford’s not willing to give up the Pac10, Cornell’s certainly not going to give up the Ivy League (and both Duke & Stanford, or a bunch of other Pac10 schools would be better for research). No one cares about Cornell sports except a small handful who care about Cornell hockey, so Cornell would be a tremendous drain on the athletics front. They won’t make up with it on the research end either because even though research dollars are gigantic, the collaboration aspect is iffy (and regardless of what some bloggers might say, you don’t get Senatorial influence by adding schools). –a certain welfare recipient in sports. –Unknown benefits from research collaboration. Um, no, Cornell can not “easily buy” the BTN. What funds do you propose they use? The research grant money that is suppose to go towards, you know, research? It would be an endowment investment. but, yes, as the Big Ten Network is not for sale, you are correct in asserting that Cornell cannot buy it. Stanford university is not an option for the Big ten due to the extreme time zone difference of 3 hours EST & 2 hours CST. In which case Michigan, Northwestern, the U of C, Notre Dame, UT, TAMU, and Duke could all buy the BTN as well, since they all have a bigger endowment than Cornell. Richard: Although they may have the means, they still cannot buy something that is not for sale. Michigan & Northwestern are already part owners of the Big Ten network. Regardless, I was only trying to illustrate my point that the truly big money for research universities is in research grants & not athletics–even for the Big Bucks Big Ten! The twelth Big Ten Conference member is Notre Dame. Now it is best to focus on whether the Big Ten should expand beyond twelve teams to 14 or 16 teams. Next move depends upon the Pac-10. If the Pac-10 enlists BYU & Utah, then Missouri & Pitt will be the best Big Ten candidates for growth to 14 teams since Cornell will want to remain in the Ivy League. But if the Pac 10 signs up Colorado, then the Big ten has some big research to do as to the desirability of a 16 team conference if Texas wants in. Pitt doesn’t bring a new TV market. Mizzou is very blah (I can more easily understand some combination of Rutgers/’Cuse/Maryland for a move East). The Pac10 won’t take BYU. For that matter, Utah is in a small population state and doesn’t even command the loyalty of the majority of the people there. Pitt locks up lucrative recruiting grounds for the Big Ten, enhances Big Ten basketball viewership & revenues, is going in the right direction academically, regenerates the football rivalry with Penn State, makes geographic sense & solidifies the TV market with higher ratings. Missouri has great football & basketball programs, one of the top two journalism schools (along with Northwestern) in the country, makes geographic sense–especially when standing in Texas & looking towards Big Ten country! Richard: I am curious as to why you think that the Pac-10 won’t take BYU? Byu & Colorado would add a great deal of excitement & diversity to the Pac-10 which has publicly stated that it wants two new members this year prior to renegotiating it TV contract. I recall reading recently that the Pac-10 was considering BYU, Utah, San Diego State & Colorado as expansion targets. Not certain, but this statement may have been publicly made by the Pac-10 when discussing their upcoming TV contract renewal negotiations. BYU doesn’t play sports on Sundays and isn’t a research university. Also there’s some religion thing. Granted, other than the Sunday sports issue, same thing applies to ND, but ND is worth bending backwards for, and BYU isn’t. I’d take any report that listed SDSU as a Pac-10 candidate with a grain of salt. Agree about the grain of salt report as it may have been the NYT.